The dedication of Georgia’s new Capitol on July 4, 1889 was an exercise in mixed metaphors. The ceremony, a grand legislative procession from the lawmakers’ temporary digs in an opera house on Marietta Street to the gilded edifice six blocks away, was carefully staged to symbolize democracy as an institution. According to a reporter from the Atlanta Constitution, the Georgia General Assembly members “walked deliberately and quietly, unattended by any flourish of trumpets. It was democratic simplicity personified in the representatives of the people.” And it is with this image of democracy—easily emphasized by the Greco-Roman architecture of the Capitol building—that we encounter the dedication ceremony’s first blundering paradox: amid the over 200 members of the procession, there was only one African American. The sole black participant in the procession was Samuel A. McIver, a House representative from Liberty County. In 1889, African Americans accounted for almost 45 percent of Georgia’s population, yet were consistently barred from the political process through official state policies and ballot-box discrimination. Governor John B. Gordon—living representation of the Confederacy and leader of Georgia’s Ku Klux Klan—waited patiently at the Capitol for assembly members to arrive. With a flair of dramatic irony, McIver marched toward Gordon, a man who used both legislative and violent means to deny African Americans participation in democracy. As the members of the democratic parade ascended the stairs and strode through the Capitol’s west entrance, they passed below sculptures of men and women, each personifying a democratic ideal. The female forms represented liberty, commerce, and prosperity, but in Georgia, an 1889 constitutional amendment denied women the right to vote. And unlike McIver, no women were represented in the Georgia General Assembly. 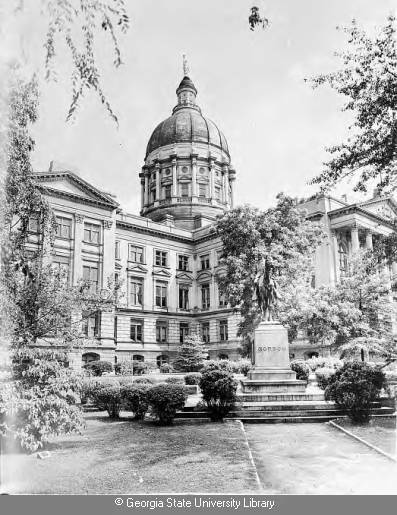 The first female members of the statehouse weren’t elected until 1922. Gordon and his legislative procession more aptly highlighted Georgia’s racial and gender disparities in political representation. On July 4, they displayed their own version of democracy, an institution where all white men were created equally.